Big Hungry Shelby: Fajitas: Stop Complaining and Start Cooking! 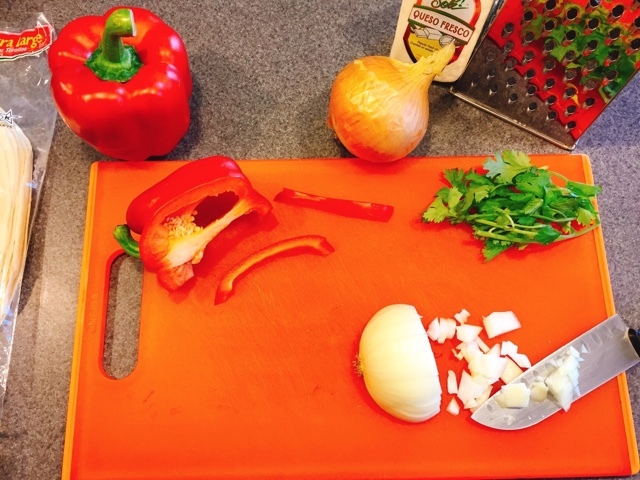 Fajitas: Stop Complaining and Start Cooking! I realized I've complained a couple times lately in my Watertown Daily Times column about Mexican food and fajitas, and their authenticity. Recently, my parents came to visit, and to make up for the disastrous beef fajitas my Dad had endured at the River Valley Inn, in Lewis County, I made a huge feast of both chicken and beef fajitas - complete with varying spice levels tailored to each parent. When my Mom dug into her spice-free chicken fajita, she proclaimed, "I can never order fajitas in a restaurant ever again! These are the best I've ever had!" God bless that woman; her support of me is steadfast and unwavering, even if, perhaps, unwarranted. I highly doubt those were the best chicken fajitas ever rendered, but it did help me realize that if I'm going to write lots of cranky things about other people's Tex-Mex food, maybe I should sack up and share some of my own recipes. Fajitas are not exactly authentically Mexican, no matter how you make them. They are a Southwest invention, basically tacos made by Mexican expat cowboys from the skirt steaks their ranch owner bosses tossed their way after butchering cows. The steaks were tough, so marinating them was a way to break down some of the connective tissue and make them palatable. There IS a Mexican taco variation made with marinated skirt steaks as well, but they go by another moniker. Whisk these all together, pour over meat and store, either in a bowl or in a zip-top plastic bag; up to four hours for chicken, up to 24 hours for beef. Again, whisk the ingredients together, submerge the meat in them, and refrigerate up to four hours for chicken and up to 24 hours for steak. 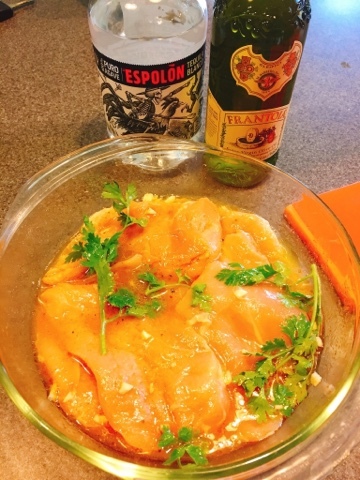 Especially with the chicken, you don’t want to marinate too long in citrus juice, because it will affect the texture. 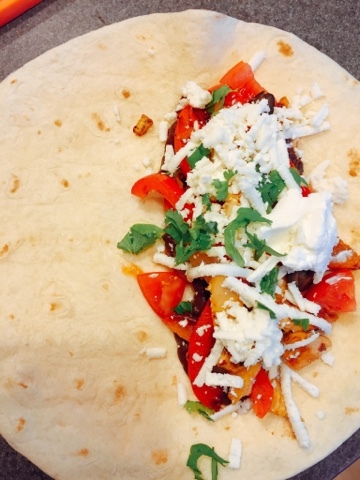 OK, so you’ve got some really flavorful meats; now you need to make them into fajitas! The next steps are more of a method than a recipe, as this dish is customizable in many ways. That’s why I love serving fajitas to guests — there’s a combo to please everyone’s likes here. I’ll outline my method and then give you some options. 1. 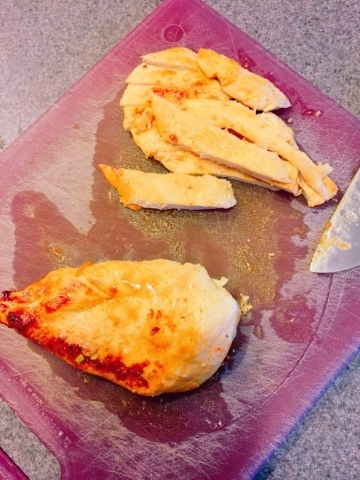 Grill the chicken breasts or steak on a hot grill until just cooked through. Let them rest, covered, for 10 minutes before slicing into thin strips for service. 2. 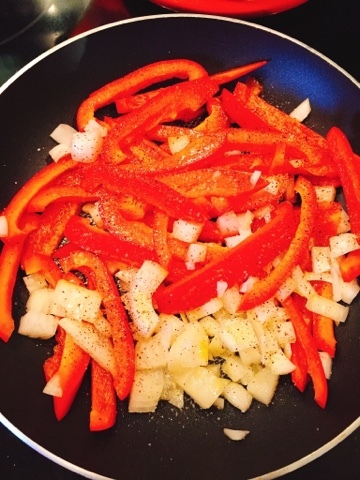 In a large skillet, heat oil over medium-high heat and sauté onions and bell peppers seasoned with salt and pepper. Cook until brown at the edges and just tender, about 10 minutes. Remove from heat. 3. Place tortillas on a microwave-safe plate and cover with a paper towel soaked in water and wrung out. Microwave for one minute to steam them and make them pliable. You can also cover them in foil and heat them in a warm oven for 10 minutes if you don’t have a microwave. 4. Arrange shredded lettuce, tomatoes, shredded cheese, olives, cilantro and lime wedges on a large platter. 5. Arrange sliced meat, onions and peppers on a separate platter. 6. Serve salsa and sour cream in small bowls with spoons. 7. Let everyone assemble their own fajitas from all the ingredients — it’s a party! You can use a bag of shredded Mexican cheese rather than the cheeses I listed, if you’re short on time, but you will derive much more flavor and superior texture from cheese you buy in a block and shred yourself. 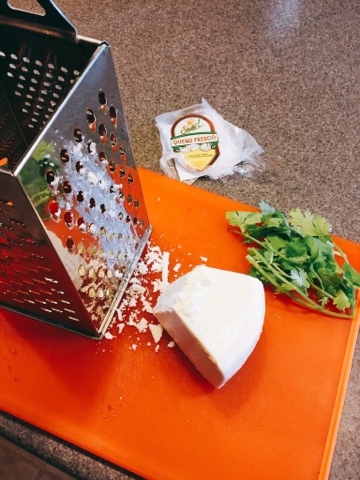 Queso fresco is stronger, with an aged, salty flavor similar to feta. Queso Oaxaca is creamier, sort of like mozzarella. It melts better than the fresco. 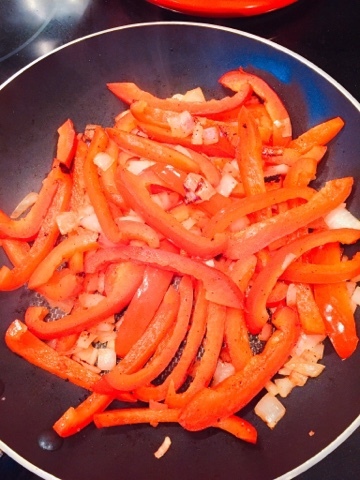 I season the onions and peppers only with salt and pepper because the meats are so well seasoned from the marinade, but you can add some taco spice, or cumin, coriander, cayenne and onion powder if you want to kick it up. 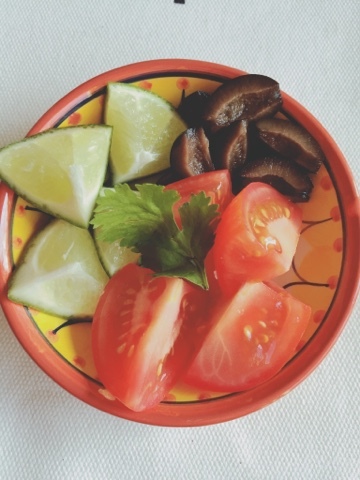 You can also add hot, fresh chiles, sliced, to this sauté, or mushrooms, zucchini, yellow squash or other vegetables if you want to make this meal even healthier or cheaper, by offsetting the amount of meat you need. While we’re giving healthy options, corn tortillas are much lower in calories than flour. You can swap them out, if you like. Your salsa options are endless, and can really customize your fajitas. 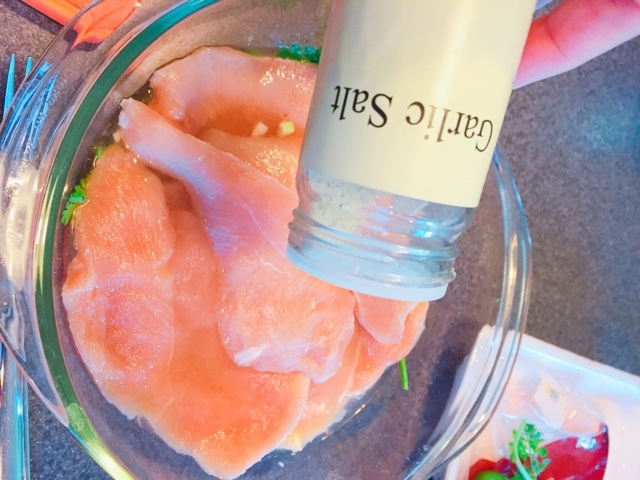 Make your own from fresh diced tomato, white onion, garlic, cumin, and fresh cilantro and lime juice, or buy mild, medium or hot in a jar or fresh from the produce section of the grocery store. Our favorite is Wegmans Roasted Tomato Salsa. Cook up a drained, rinsed can of black beans with a tablespoon of bacon fat (or butter), a packet of Goya Sazon and two tablespoons of salsa, and you’ve got a delicious and hearty side dish. 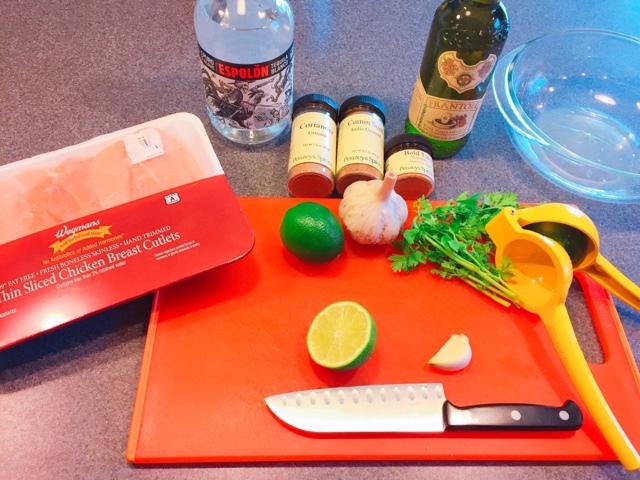 Make your own cilantro lime rice by making long grain white rice according to package directions, then stirring in a tablespoon of butter, salt to taste, a handful of chopped cilantro, the zest and juice of one lime, and a sprinkle of cumin. Cooking it in chicken stock instead of water makes it even more flavorful. 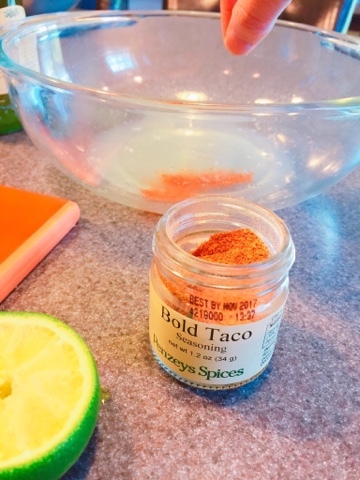 So that’s my favorite fajita recipe and just about every way I’ve played with the method over the years to customize it to the likes and dislikes of my friends and family. This recipe is easily doubled or tripled to feed a crowd, and in the winter, you can cook the meat inside in a skillet or on a stovetop grill, if your outdoor grill is snowed in. We also sometimes like to make both chicken and beef, so that everyone’s happy. 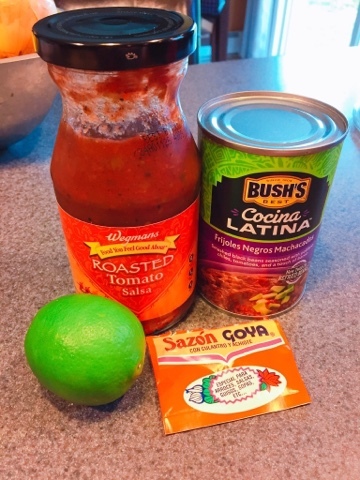 I may not have a drop of Mexican blood in me, but what I do possesses is a deep-seated love of the flavors of traditional Mexican fare: Bright citrus, salty cheeses, grilled meats and fiery chiles are exciting, fresh flavors that aren’t often found in our New York kitchens. 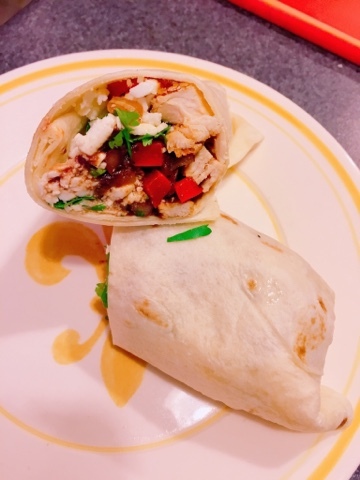 I hope you give my fajitas a try and let me know how you like them! My personality is big; my hunger is bigger! And this reminds me I need to place a Penzey's order. So thank you first for the recipes and second for the reminder.